Happy New Year! And now that we've entered 2018 its probably the right time to do a little round up of the year. Its not been the easiest of years for sure but as you know that just makes me work harder and means that the drawing on hard earned knowledge alongside attention to detail gets the results in the end! 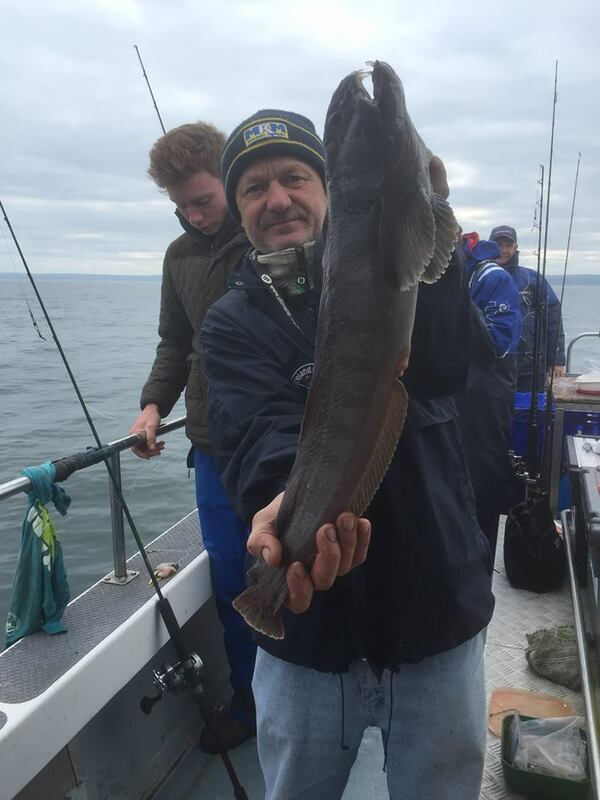 We did get some lovely fish and saw friends old and new get some cracking cod, ling, pollock and catfish (Woof) along with quite a few anglers getting personal bests- so not a "bad day at the office" at all really. As is normally the case we started the year uptiding, though we did lose some time due to bad weather and maintenance. 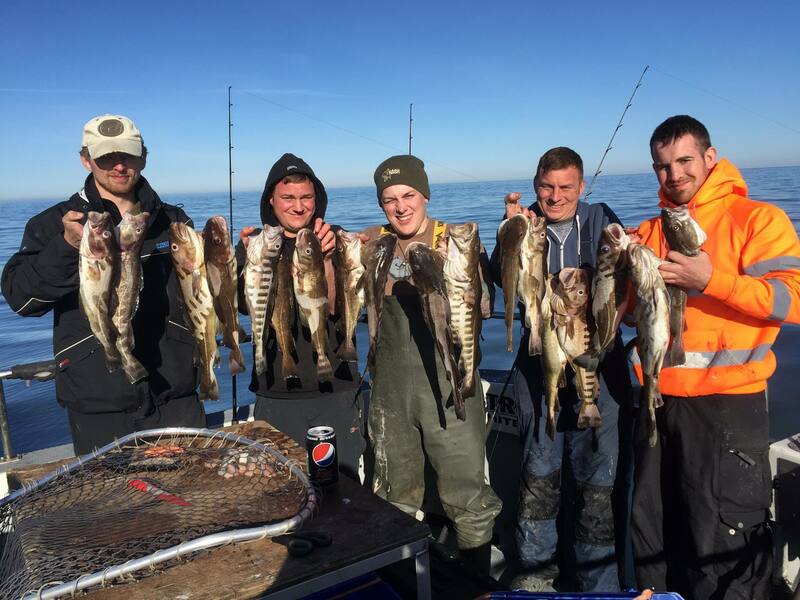 When we did get out we did very well with most anglers catching between 5 and 15 codlings including plenty in the 5-7lb bracket. As you would expect it was cart, black lug and squid that did the damage at this time of year. 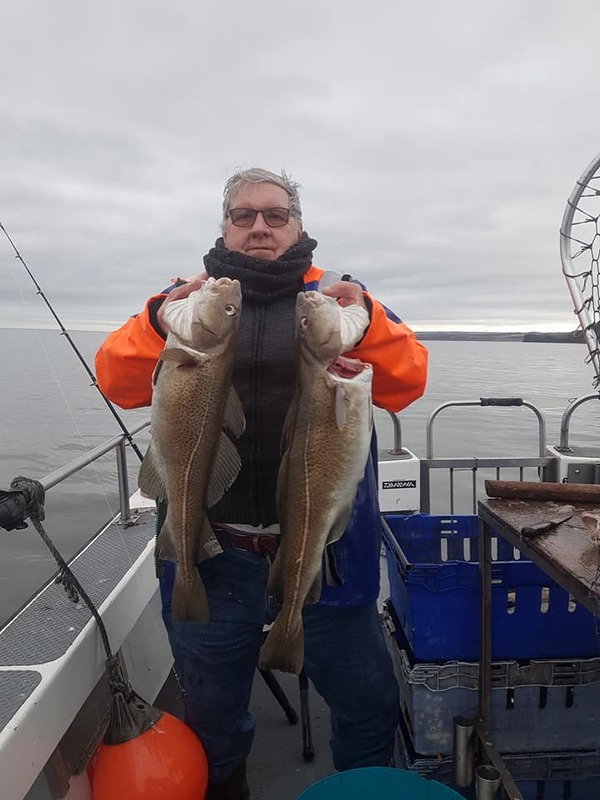 The weather played havoc with our schedule again in February but in early March we tried our hand at the last pickings of the uptiding season..and were pleasantly surprised! 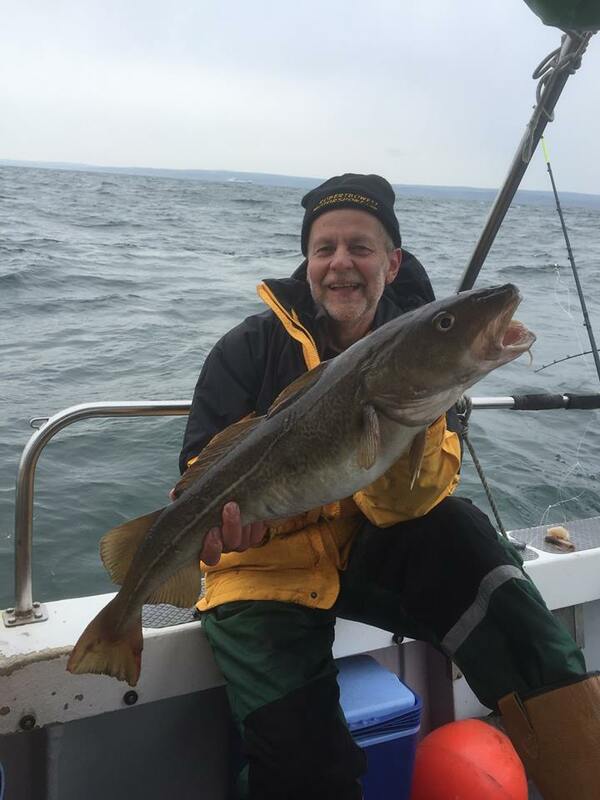 Most anglers were managing about 8-9 fish of a lovely stamp and there were plenty of (legal size) chuck backs returned to grow on. 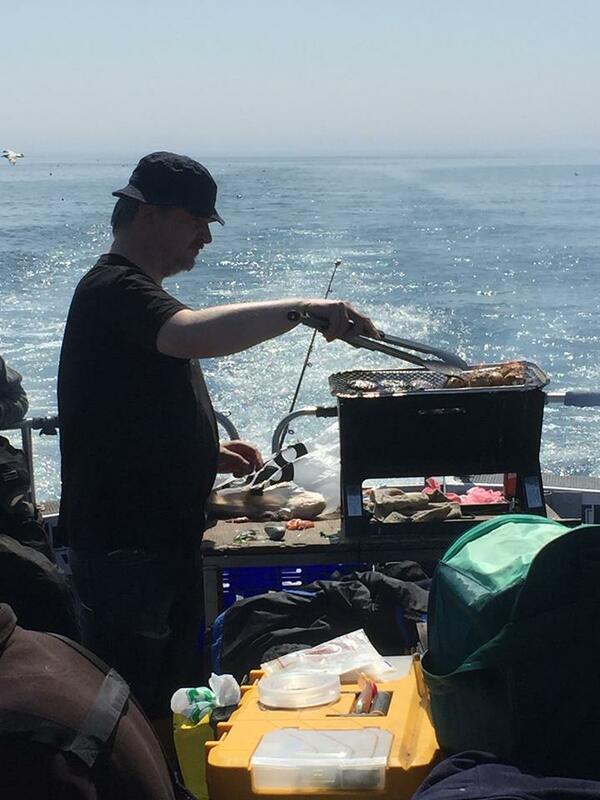 It really was entertaining fishing! 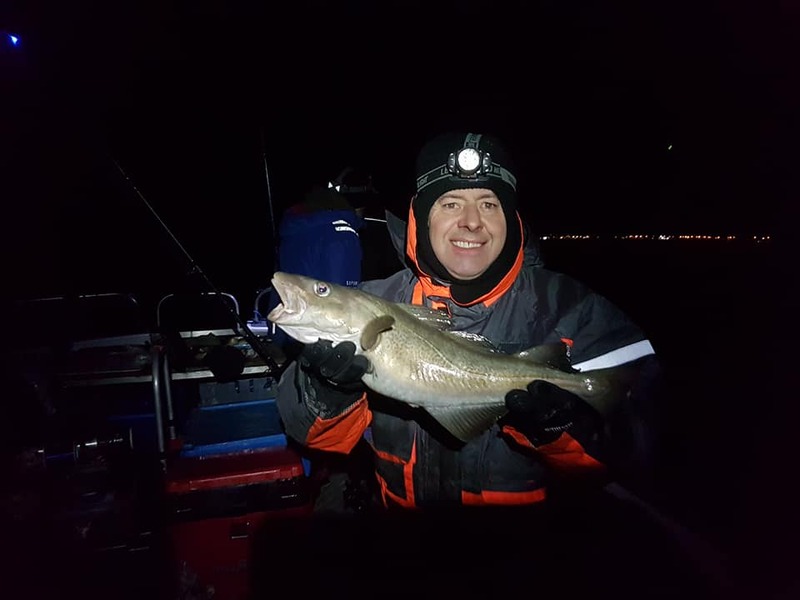 Spurred on by this we tried some night trips and while the sport wasn't as hectic as our daytime sessions, all the lads got some nice quality codlings. 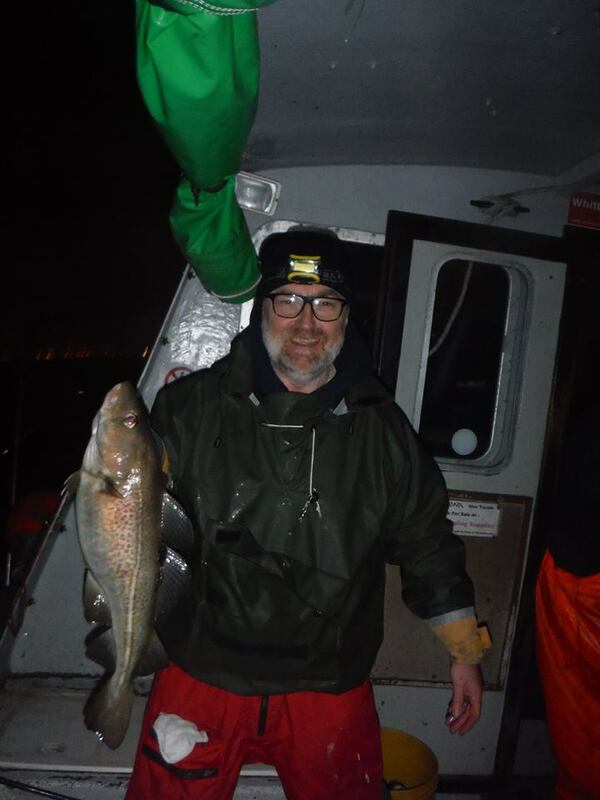 That said, some of our evening trips saw individual anglers take 10 fish home of between 3-7lb and return many in the 1-2lb bracket...not bad for 4 hours at sea! Before we knew it we were into late March and that meant one thing...a crack at the wrecks! On our first run off I was looking at the water all the way out and thought it looked hellish green, so wasn't totally confident we were doing the right thing. We were all keen and fired up for it though, we had a back up plan of dropping back inside uptiding if things didn't run to plan. 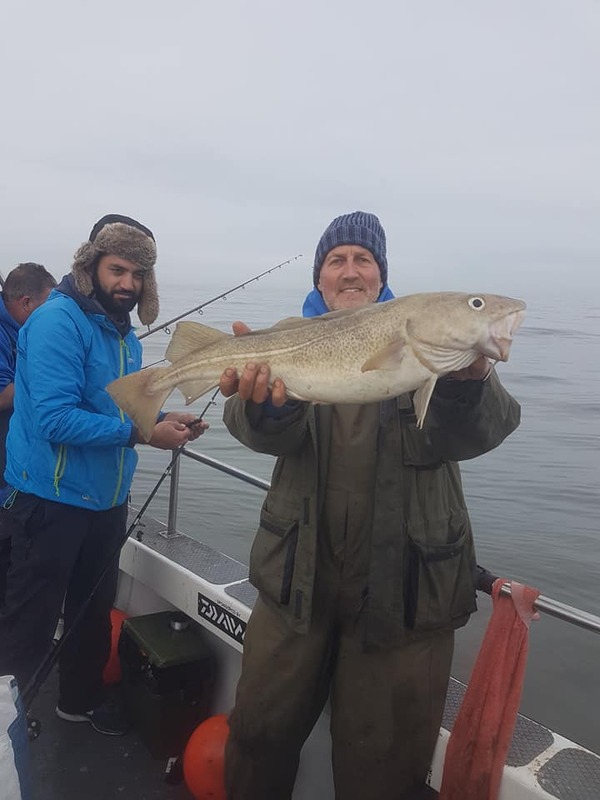 With a few moves around a few wrecks though things started falling into place with us getting 5 or 6 cod a drift at times to shads, as the tide picked up the fishing tailed off, but we'd managed to rattle a good few fish out for the lads to shads and bait. 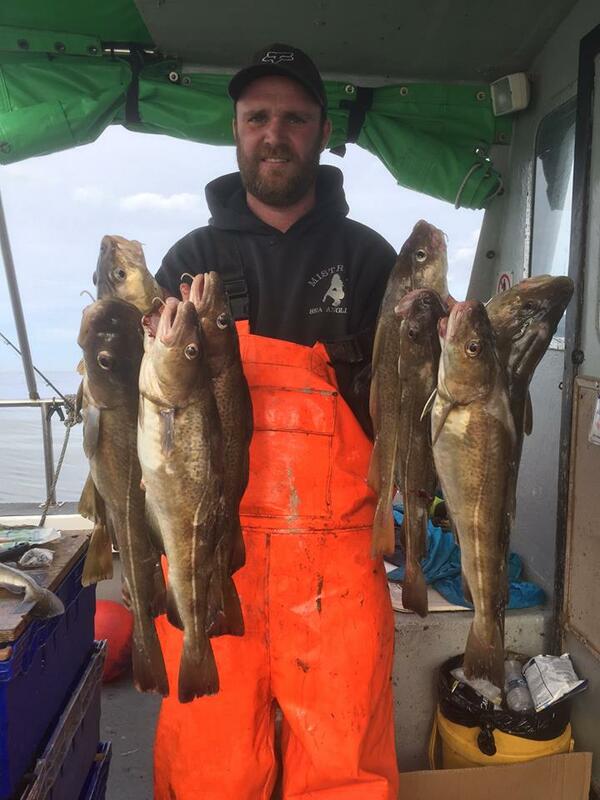 I ventured back inside for the last hour to finish off the day at anchor and we were still catching the cod getting another 6 or 7 in the last hour, The best lad managed a respectable 9 fish for his efforts with us finishing up with around 50 keepers for the day for the boat. Mid-April and we were back out wrecking and starting to nail the fish on the shads again! 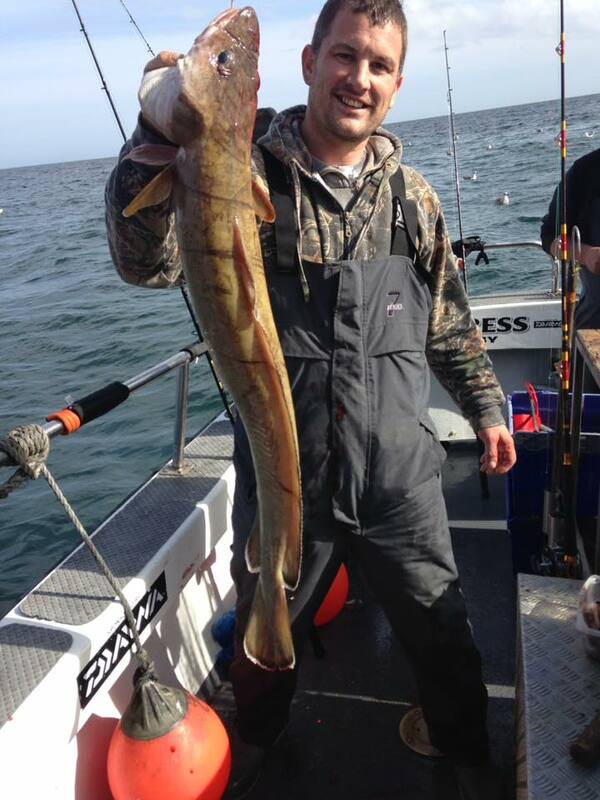 saying that squid fished very well for us too with some days seeing most fish taking bait. I would say we were averaging 30-50 fish per trip, but some days we were blighted by what looked like an early algae bloom with the water being very green. Still we took fish and got a daily second in the Spring Festival...and one angler got a bonus "Woof"...tasty! 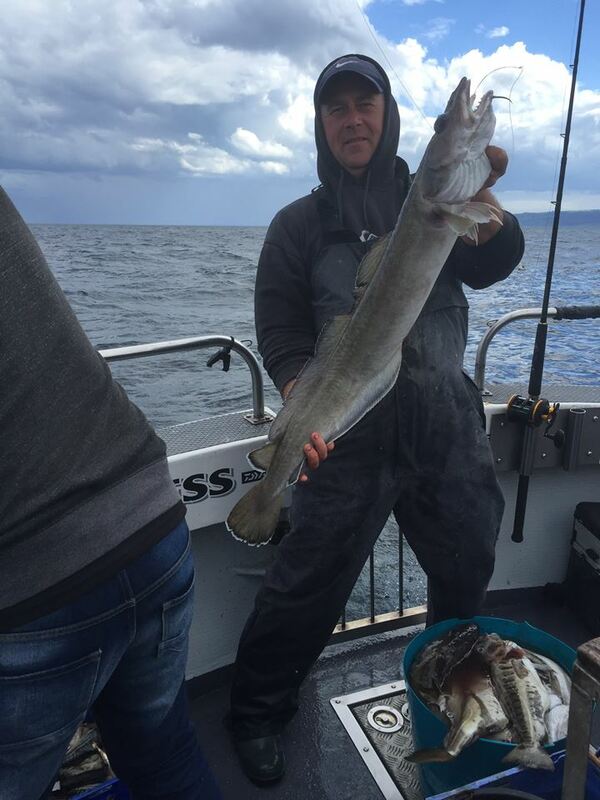 Throughout the rest of April we lost some more time due to weather and while the fishing wasn't on fire due to May Bloom, we managed some very nice fish to shads, bait and baited hokkais..which meant anglers of all tastes got a piece of the action. 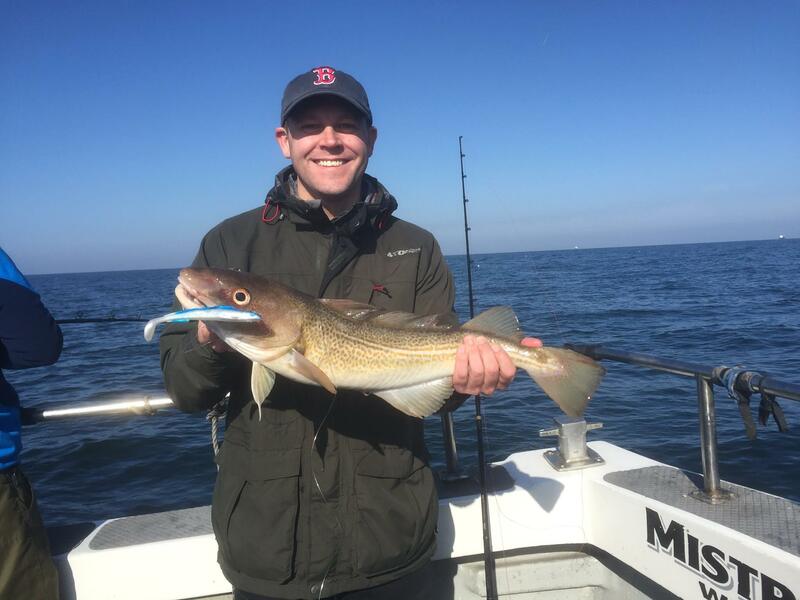 Throughout the rest of May (when weather allowed) we saw water clarity improve and with it so did the catches of cod and pollock. 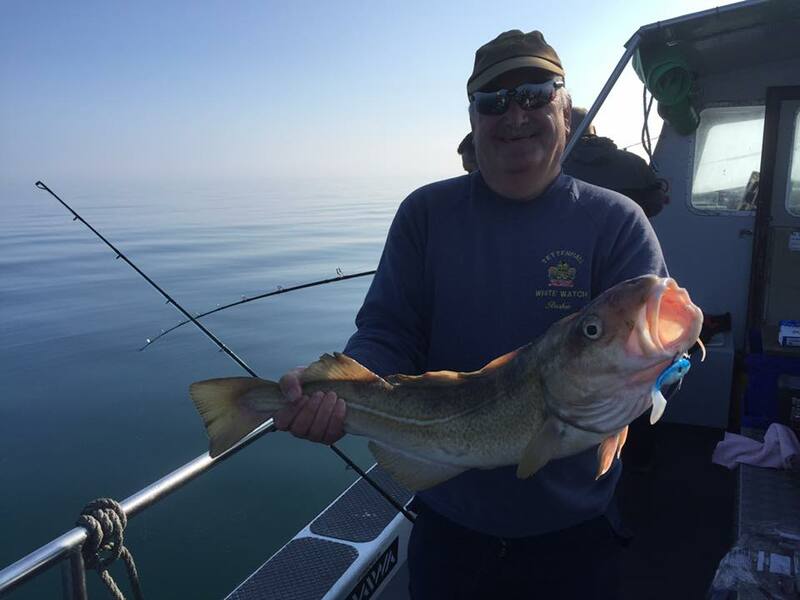 We ended May with steady catches but saw increased baitfish activity and a few better ling poking their heads out we new that Summer and mackerel were just around the corner. 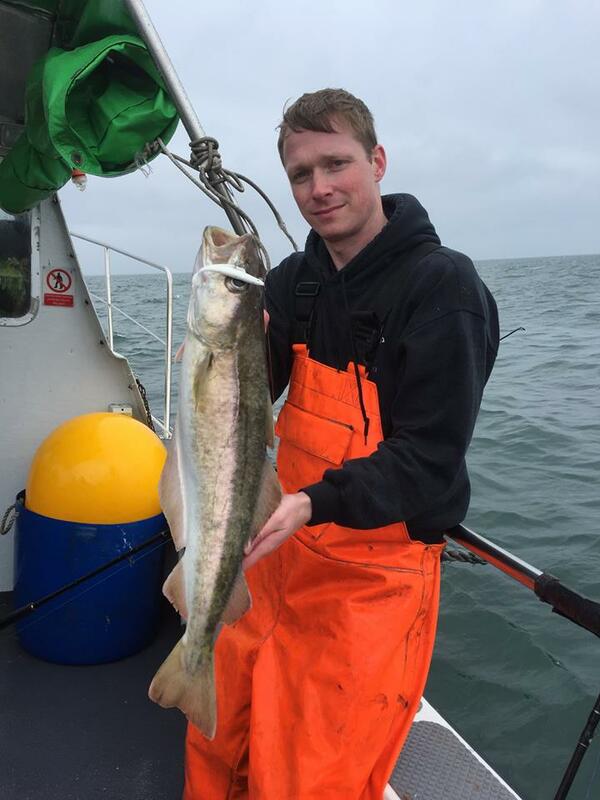 As May turned into June we had already seen the first mackerel and cod, pollock and ling were actively hunting baitfish on both wrecks and ground. With that catch rates went up and inevitably saw some very nice fish as they went literally "Shad Mad"! 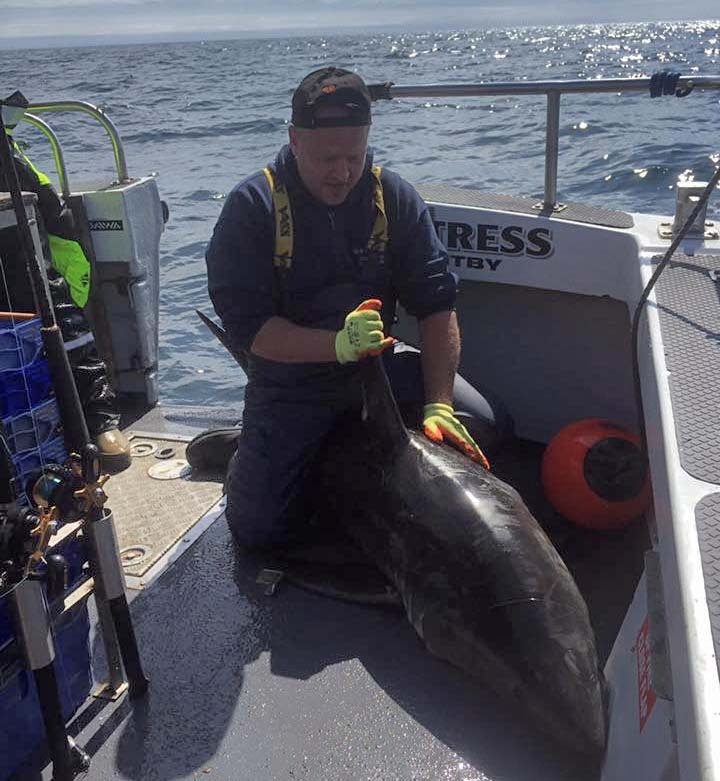 Then came the biggest surprise of the year..and one you probably read about - the shark! 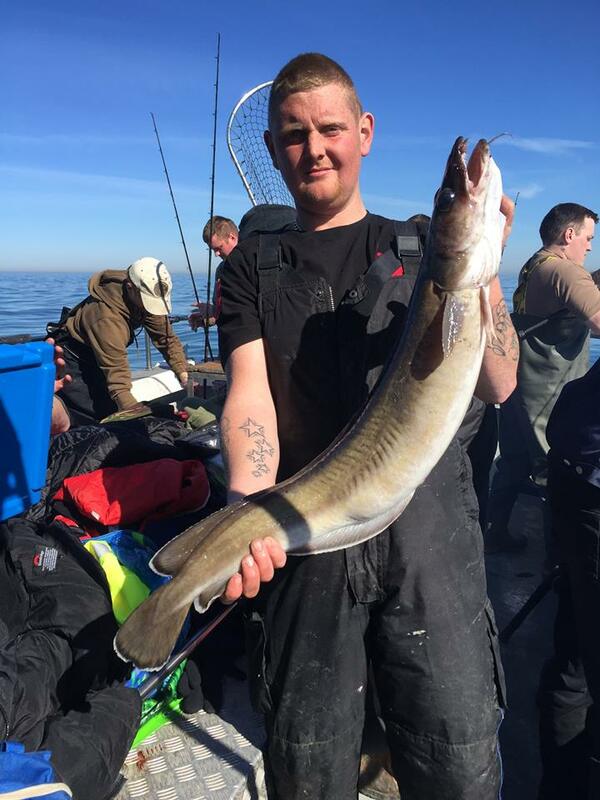 We were a bit worried about the lack of mackerel leading upto the trip, we needn't have worried they we managed to land ourselves on a mackerel nest and managed 70-80 in a short time meaning we had enough chum and hook baits all day. 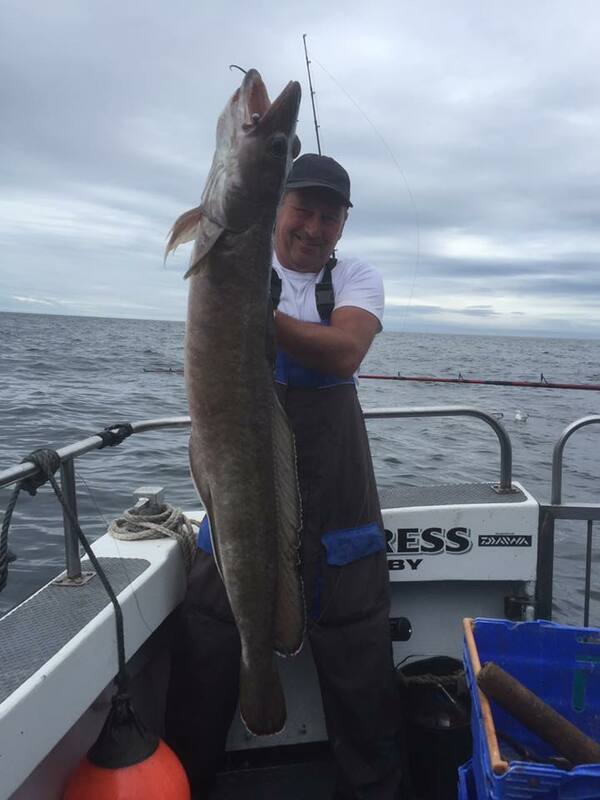 With about 15 mins of anchoring and getting the baits in wed our first run which we hooked up with, after a strong 45min fight we got the beast aboard where we're took photos and measurements, then it was slid back in through the gate where it swam off gracefully. The media interest created by this was immense - it made national and local newspapers and you may have even heard my dulcet tones on the radio as the story went ballistic! I did manage to swerve the jokes about having a "Face for radio" though! 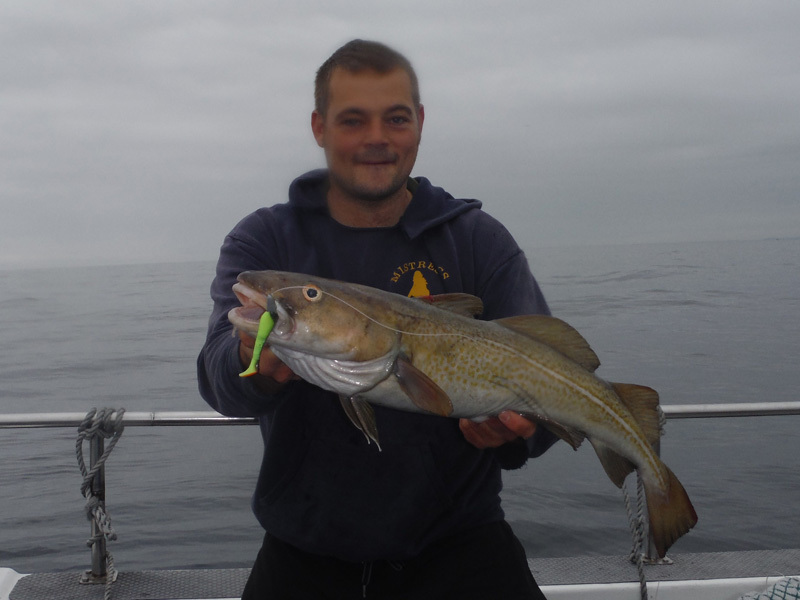 Of course you can't expect "Ton up" fish every trip but double figure cod and ling kept us more than entertained throughout the remainder of June and into July and August. Summer Festival saw us hunting the biggies and needless to say we clicked a few. We thought this ling would have won the £5K prize but it was beaten at the final post. Tony (captor) will be weighing in its Dad in the 2018 competition! 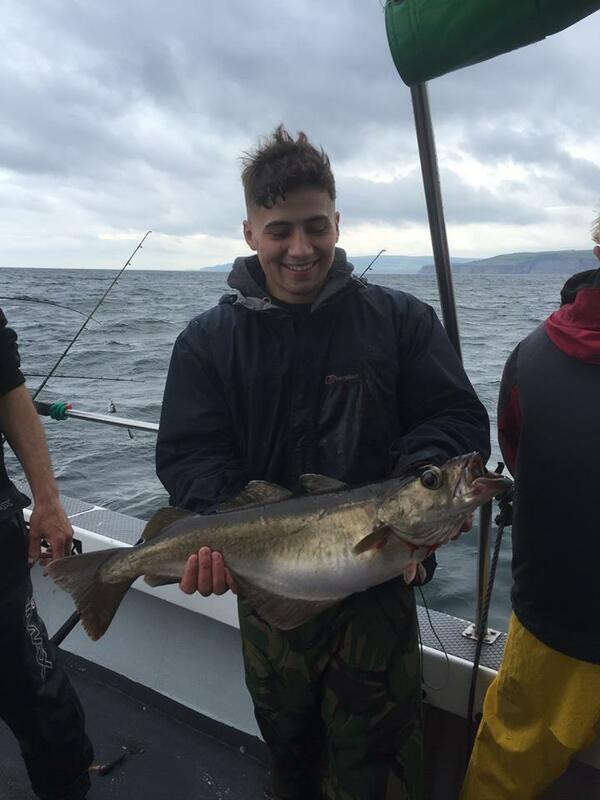 Moving into August we saw some fantastic catches with double figure cod, ling and pollock on every trip that weather allowed. 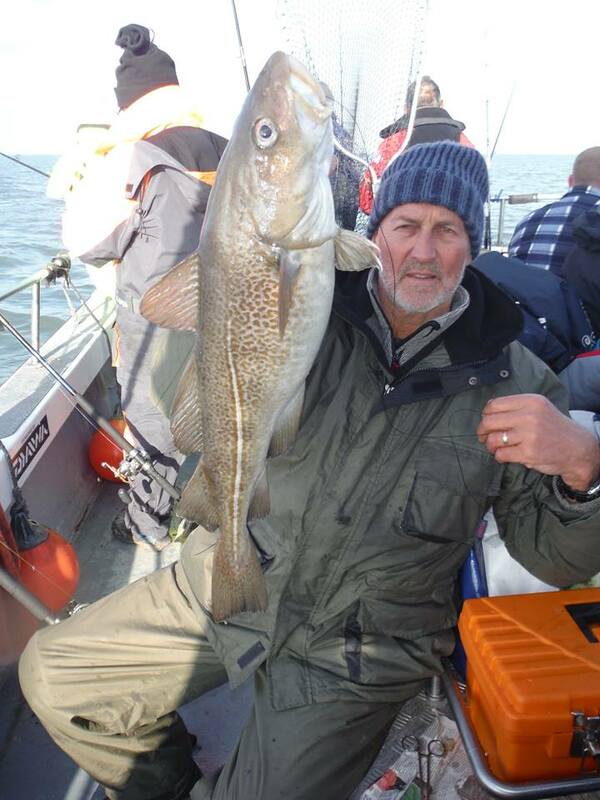 There were also good amounts of fish in the 5-9lb bracket to both bait and shads- we had plenty of very happy anglers! Moving into September we saw the better fishing in the neap tides and slowing off the springs, until however we made a decision to try the uptiding early, well, first day produced around 50 codlings to keep between 7 of us, best lad taking around 15, with a lot of undersize throwbacks. As we get into Autumn there is no denying that weather becomes (even more) unpredictable...we lost quite a few days! I continued on with the wrecking on the smaller tides as the water cleared from the last blow up. 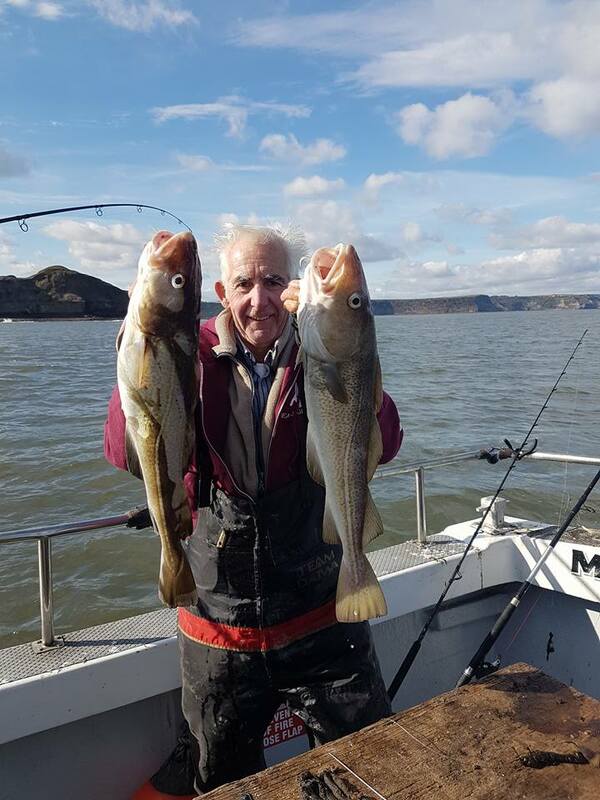 Our best day in Early October was around 60 keepers with ling featuring heavily in these catches with quite a few into double figures. 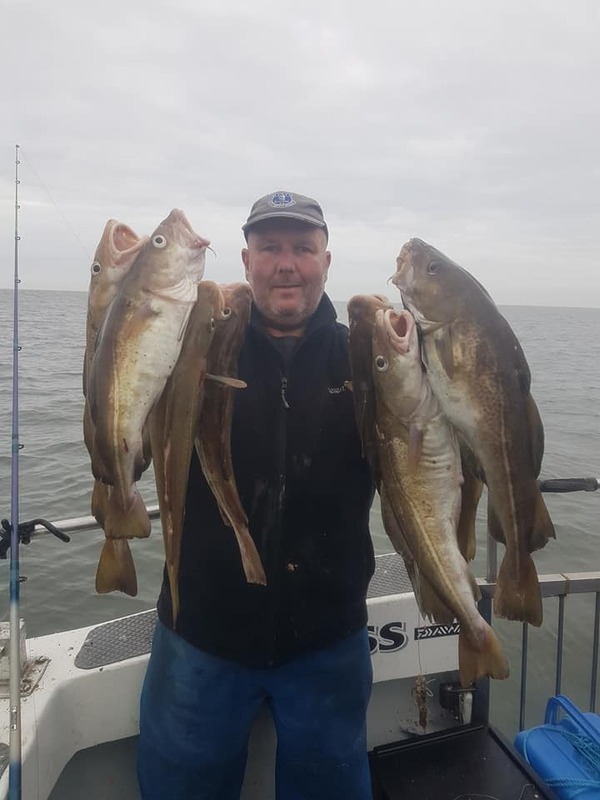 As Late Autumn set in we became more focused on the uptiding and had some good days with a typical session seeing 60 codlings kept to 6/7lb between 5 of us, all keepers were 40cm + with many under that thrown back. Top bait was again crab cart, worm and squid also taking fish. November saw the uptiding heat up even more. 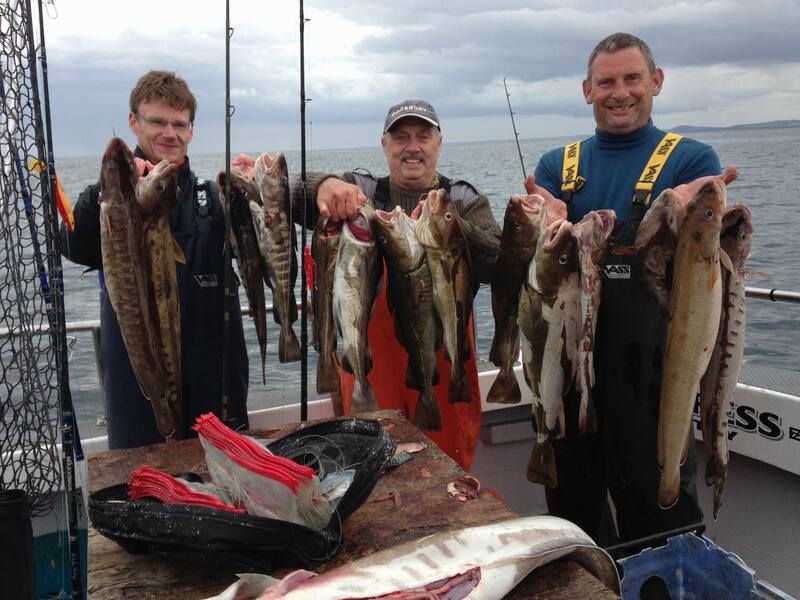 One trip saw over 100 keepers boated with the best angler taking 25 between 3-9lb. Our evening trips saw similar catches too...we became quietly confident for good uptiding until the year end! In the Whitby Uptide Festival we were consistent to say the least! We managed to secure 1st place this year, both in the heaviest fish and heaviest bags section, plus many places in the top 10 leaderboard. 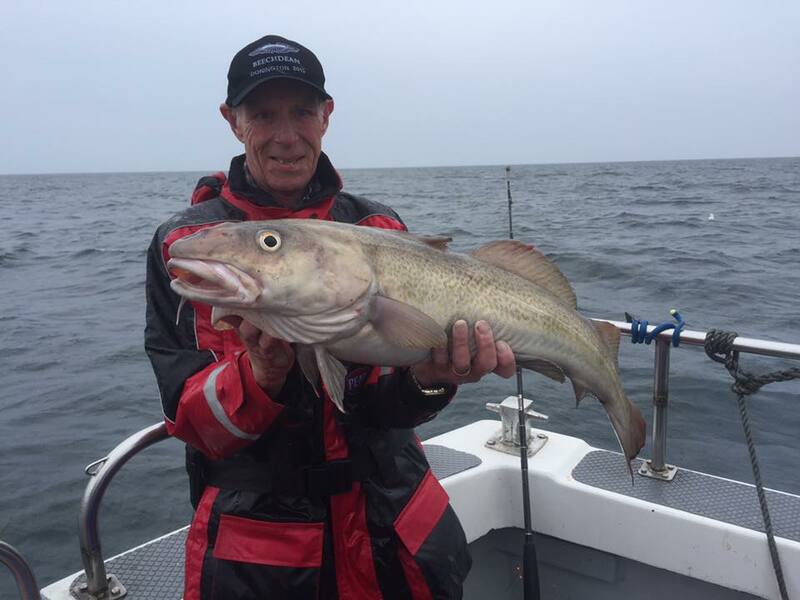 Graham Jones from Ackworth near Doncaster caught the winning 7lb 1oz cod netting him a massive £1000 for an early Christmas present! Local angler Alex Leadley got the two heaviest bags of the festival, his winning bag totalling over 61lb! His other bag was 51lb+ with a 40lb+ bag to Mistress regular David Gleadall from Huddersfield the same day. All of November and right through December saw excellent uptiding on both our day and night uptiding trips. Bags of 25 fish for the best anglers weren't uncommon, with 10-12 being around the average. 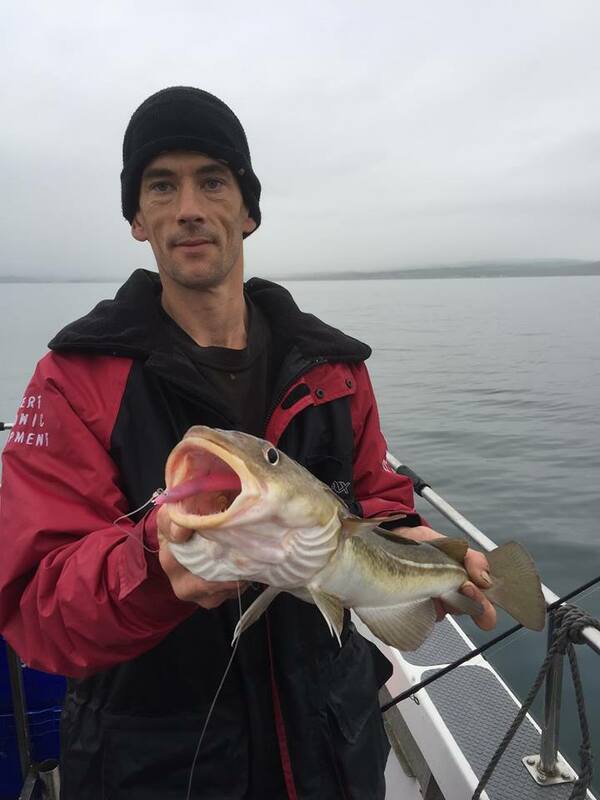 In the run up to Christmas we got out a few times and again the average catch was 10 codling but they really were of a decent stamp. Off the back of that we sneaked in a couple more trips to see off 2017 and again got good results. All in all 2017 was a good year. Hard work at times but when the going is tough it just means I work harder for you anglers. I hope you all enjoyed your trips on Mistress in 2017 and I look forward to sailing with you in 2018.